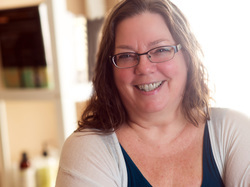 Paula is a joyful, principled, independent-minded polymath currently acting as a clinical specialist in health and healing through East/West Manual Therapies of the Fasciae. With an eye for the details and the big picture, she is driven to help advance scientific understanding of the mechanisms behind the incredible healing and prevention benefits of manual therapies, both ancient and modern, for the benefit of All. Paula is at once a self-conscious master, forever student, and stubborn joy-finder. Health problems can be scary, but they don't have to be if you see your own body as a joyful place to explore and learn what makes it feel healthier, stronger, and more resilient, and that's where the magic of joy comes full circle: Joy within peace is the fountain of youth and healing for our bodies and our lives. The goal of Paula's Body Shop is to help people return to a higher level of health that leaves them far more resistant to stress, injury, disease, and the ever-increasing chronic illnesses that plague our modern world. Louis Pasteur realized, shortly before his death, that “The microbe is nothing; the terrain is everything.” Your body's fasciae system is your terrain and your best defense against pathogens. Fix up your body today for better tomorrows. Paula retired early from a successful career as a computer programmer/analyst in the education, military, and financial industries. Always independent and outspoken, Paula was not satisfied with increasing job limitations via specialization (it's a joy killer), so she left behind 20 years of computer passion to create a new, independent life devoted to helping others, even though she didn't yet know in what way. With her health history, it was a scary, daring thing to forgo both her salary and health insurance without a safety net, and yet it was the path that led her to innovative health and healing through natural and self-empowering means. ​Paula has a remarkably sensitive, caring, and inquisitive nature grounded in the search for truth through accuracy. Like many, she was encouraged to ignore her body's needs and “toughen up” to serve only the needs of others, eventually becoming habituated to nervous gregariousness, which plays a role in health. Consequently, instead of giving her sensitive system the care, education, and understanding it needed to thrive, Paula's body succumbed to the inevitable: chronic pain and sensory overload. and a bodyworker devoted to neuromuscular exploration provided complete relief from severe neck and shoulder pain, in just one, 2-hour visit, that lasted an entire year. Despite the propaganda that alternative practitioners of all kinds were quacks, Paula could not dismiss the fact that allopathic medicine disempowered her and thereby kept her chronically ill, while so-called quacks were actually making a difference. This impressed her to her core and left her thirsty for a better understanding of human health so that she could help others avoid the unnecessary pain and sickness that marked too much of her life. Two years of soul searching after her corporate retirement and four months working by the side of a gifted veterinary surgeon while on hiatus in Mexico, Paula discovered she had a natural gift (so to speak) for touch-based healing and at the urging of a friend, entered massage school - and was introduced to a plethora of other forms of healing, from Eastern philosophies to vibrational medicine. Paula entered carefully into these other forms of healing. Open minded, yet critical, she discovered how to quickly separate the wheat from the chaff, keeping what worked, and dismissing what did not. The ancient and storied explanations as to why these methods worked did not sit well with her and she became interested in a more scientific approach. This is why she collaborates with open-minded, sincere Western and Eastern physicians and scholars, whenever possible. Regardless of where she might dabble career-wise, she is devoted to going above and beyond for her clients with her joy coming from her work and being able to help make a positive difference in the lives of others, often using her own body as a laboratory. There are great and cost-saving benefits to manual therapies, vibrational healing systems, and nutrition-as-medicine. Paula hopes that one-day natural medicine modalities and Eastern philosophies will be a welcome addition to mainstream science and medicine, and the gold standard for preventive care. "I strongly suspect - and suggest - that the GP doctors of the future will be hands-on bodywork palpation experts." ~ PMae. 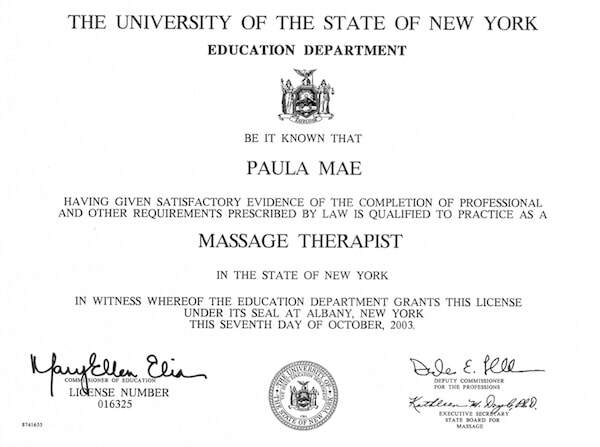 Click image to check licensing status of your NY massage therapist. Thermography Researcher and Motor Recovery (stroke) Research Lab Assistant at NYU Medical Center's Rusk Institute for Rehabilitation Medicine, under the direction of Preeti Raghavan, MD. 2010-2011 and ongoing as needed. Fascia and Connective Tissue Dissection Research Assistant to Antonio Stecco, MD, from Padua Italy at the Touro College of Osteopathic Medicine Cadaver Lab. 2011-2013. Despite great desire to receive a formal education, it just wasn't possible. Thankfully, her love of learning more than made up for any lack in formalities. With many thanks to some great educators early in life, a few astute bosses later in life, and being lucky to work with and learn from top professionals from a wide variety of careers, she gained at least the equivalent of a bachelor's degree, something very common to autodidacts. Eventually, Paula learned to appreciate the intrinsic rewards that come from gaining mastery in subjects of interest, in lieu of seeking certificates, diplomas, or awards. Your understanding is appreciated. Seeking the true, active components within alternative and ancient mechanisms so that scientists will find them worthy of exploring instead of ignoring.